China's emergence as a major, and valuable, market for B.C. lumber producers is gathering speed--the country is now B.C. 's second largest lumber market after the United States. China's emergence as a valuable market for British Columbia lumber producers continues gathering momentum. The phenomenon is coming at a pivotal time. The wisdom and benefits of market diversification for lumber manufacturers in B.C. has been dramatically underlined in the last couple of years, even as the traditional U.S. market shows positive signs of sputtering back to life. For the first time, China passed Japan in 2009 as the province's second largest export market after the U.S. Final figures for 2009 had not been tabulated at press time, but export volumes hit 1.2 billion board feet by the end of September and were expected to reach 1.8 billion by year's end. The value of those shipments, however, is heavily skewed in Japan's favour. Hitherto, most shipments to China have been in low grade wood. The Japanese import primarily premium grade lumber products from western Canada. In 2008, for example, the value of B.C. softwood lumber exports to Japan was $719 million compared with a $177 million value on the softwood lumber shipped to China. But value figures aside, the growth of the Chinese lumber market is impressive. "If we keep our focus, we can reach four billion board feet by the end of 2011," predicts Pat Bell, B.C. 's Minister of Forests and Range and an indefatigable booster of the Chinese market's potential for B.C. lumber producers. Bell headed a government-industry trade mission to China this past November. It produced direct orders for some forest company participants. But potentially the most significant achievement was a written agreement signed in the mega-city of Shanghai. A new building code was adopted that approves the specifications of wood frame construction methods. B.C. also signed an agreement with Shanghai for use in low-rise apartment construction. The moves open wider the doors of opportunity. Not only can B.C. lumber producers work toward more orders from Chinese customers, but they can fill them with higher grade and valued lumber products. The logs in B.C. sawmills may increasingly be used to produce lumber in metric sizes, to gain a competitive advantage in the fast-growing Chinese market. "We are confident that the Shanghai local code provides a framework that will be easily adaptable to other cities and provinces across China," foresees Lisa Raitt, Canada's Minister of Natural Resources. The stock markets also took kindly to the Shanghai development and its implications. Interfor Ltd., saw the value of its shares soar 58.3 per cent in the latter months of 2009. Canfor Corp and West Fraser Timber achieved 31.4 per cent and 28.4 per cent boosts respectively during the same time period. B.C. producers have significant advantages servicing the Chinese lumber market. Major transportation and port infrastructure are in place with the northern outlet via CN through the Port of Prince Rupert closer to market and having considerable upside capacity potential. Most B.C. lumber producers kiln dry their products, an advantage to Chinese end users. Mills with the ability to produce lumber in metric sizes are also likely to gain a competitive advantage in the Chinese market. Lumber market growth in China for B.C. and other parts of Canada has not occurred by accident. Consistent behind-the-scenes work to make lumber respectable and reliable as a building product in China is now showing dividends. That fact is coupled with China's rebirth as a major world leader and the aspirations of its vast population for more and better housing and services in its rapidly expanding urban areas. In recent history, Canada began taking a closer look at China's potential after Mao Tse-Tung's death in 1976. The event triggered the dawning of China's official acceptance of some western influences. During the 1980s, the Canadian International Development Agency (CIDA) launched a Canada-China forestry co-operation program. The focus was not on developing a trading relationship in lumber. 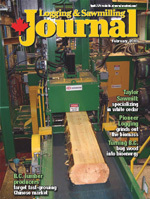 The emphasis was more on exporting Canadian expertise in sawmilling equipment techniques, silviculture and forest fire suppression strategies. Latterly, the work has shifted to market development. The Council of Forest Industries of B.C. (COFI) has been actively working in China for more than 10 years. During the last six years, the organization has combined efforts with the Canada Wood Group. The group is comprised of major forestry associations and funded by industry, Natural Resources Canada and organizations like B.C. 's Forestry Innovation Investment. "We've put a lot of effort and energy into building code development in the last three or four years," summarizes Paul Newman, executive director of market access and trade with the Council of Forest Industries in Vancouver. Newman is also a director of the Canada Wood Group team. The group's work also involves enabling and mentoring Chinese companies in the principles and practices of wood construction, he adds. As part of the Canada Wood Group's efforts to demonstrate wood as a mainstream building product, a Canada Wood College has been established along with Chinese university programs, designing software for platform frame construction and building an extensive literature library that includes a guide to good wood frame construction practices. "It's a very comprehensive program," describes Newman. The shipment profile of Canadian lumber has been in the form of lower grades which are often remanufactured into other products, he notes. The surplus of mountain pine beetle killed wood in the B.C. interior is a nice fit for the market right now, adds Newman. "But we are seeing a growing percentage of construction grades being specified and that's the focus of our work. It's quite gratifying seeing some progress." There's been less forward momentum in the composite wood product sector's exports to China. "There have been some shipments of OSB, as an element of wood frame buildings," adds Newman. "But China is a very large producer of plywood." Newman reckons there are 12 to 15 COFI member companies actively pursuing opportunities in China. The big players in the interior--West Fraser, Canfor and Tolko--have all made the commitment of establishing offices in China. Other companies have taken different approaches, like dealing through brokers. Other forest companies in the central interior to have shown interest in the Chinese market potential include the Sinclar Group (comprised of Apollo Forest Products in Fort St. James; L&M Lumber and Nechako Lumber Co in Vanderhoof; Lakeland Mills and Winton Global Lumber in Prince George); Conifex Inc., in Fort St. James and East Fraser Fibre Co in Mackenzie. Lumber demand in Asia generally and China specifically has been cited as influences in Canfor's tentative decision to reopen its Chetwynd, B.C., sawmill in May 2010 on a single shift basis. "The Chinese have been open minded about new products and invited foreigners in," credits COFI's Newman. "I think there's been a lot of structural change." As for the future, Newman feels very positive. "Shipments continue to rise and the shift is to on-grade products." How rapidly the market will further develop depends on a number of factors, he suggests. These include the further acceptance of wood buildings in Chinese markets; the fate of the Russian log export tax (which gave Canadian logs and lumber a competitive price boost); the health of the overall Chinese economy; and the continuing migration of rural people to urban centres and their demand for improvement in housing, cites Newman. Even if the growth bubble bursts, it's hard to see the Chinese market evaporating entirely, he concludes. B.C. 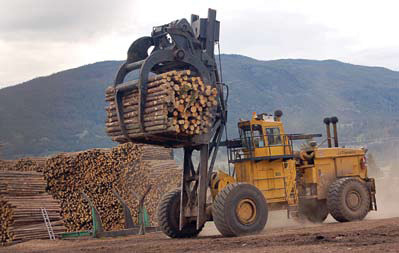 's Pioneer Logging is busy on the logging side, but the company is also very active on the grinding side, with two newly acquired Peterson grinders. Alberta's Zavisha Sawmills has achieved major volume and productivity gains in just a year's time by adopting a Lean Manufacturing management approach. B.C. 's Trace Resources is taking one heck of a lot of beetle-killed timber and turning it into fuel for the co-gen plant at the Domtar pulp mill in Kamloops. An automated marking system--with rugged printheads capable of operating reliably in challenging industrial environments--is helping an Ontario sawmill improve its reman facility. Ontario's Taylor Sawmill has cut itself a solid market slice by specializing in products made from white cedar--and making use of all of the wood fibre. Read all about the newest logging and milling equipment in Logging and Sawmilling Journal's authoritative Suppler Newsline. New players--and the dealmaking going on between the new players and older companies--are making the forest industry a more interesting game, says Tony Kryzanowski.